This is the premier leather cleaner on the market right now because of its remarkable ability to deep clean leather and make it look and feel new again. The Prestine Clean was created so the leather could readily absorb it to maximize the cleaning and conditioning power. While the formula is world renowned for it's cleaning power it has conditioners in it that provide valuable nourishment to the leather so it remains soft and flexible. After the Prestine Clean soaks deep in to the leather the surfactants help safely separate contaminates from the leather and force them to the surface for removal. Many other leather cleaners do not have the cleaning and conditioning power of the Prestine Clean, they rely on fillers to leave a glossy appearance. These fillers give the appearance of nice leather at first but over time, reduce the leathers ability to absorb conditioners that are essential to the longevity of your leather. 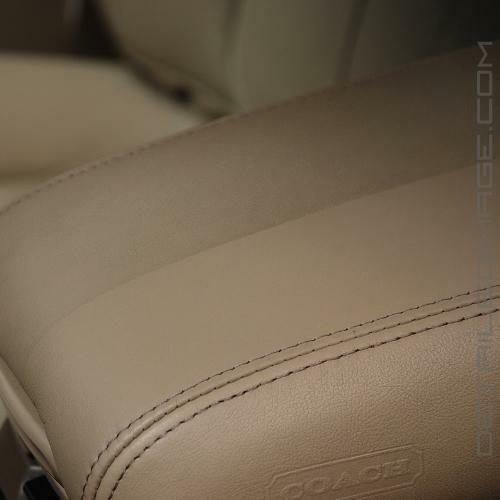 Upon completion it leaves a beautiful matte finish that shows what clean and healthy leather should look like. Use it safely on leather, leatherette, vinyl, plastic and rubber surfaces. Therefore it works on virtually all seats and many interior trim pieces if desired. Leatherique has recently worked with the finest perfumers to create the great classic leather fragrence that makes this product a joy to work with. This subtle fragrance will linger on your leather, and the aroma has a touch of mimosa wood undertones that everyone loves! Upon completion the clean and matte appearance combined with healthy leather makes this the ideal leather care product. Leatherique also recommends that you use the Leatherique Rejuvenator Oil before hand for best results. Prestine Clean will leave your leather with a clean, matte finish that is noticeably soft to the touch. I find myself using Leatherique Prestine Clean on just about every car that I detail, including my own personal vehicles. It's very easy to use, it has a long proven history, it's quite versatile, and it works...well! [It's] a very powerful (yet safe) and versatile all-in-one leather product, meaning that it cleans, conditions, and provides UV protection. I have been using Prestine Clean for years on many different manufacturers' leather interiors. One thing is consistent with the product; it cleans oils and denim transfer with no apparent negative effects on the underlying leather. I'd highly recommend you clean your leather steering wheel with Prestine Clean. If it's not damaged, the wheel will feel like it did the day you purchased the car. "Simply The Best Since 1968"
The perfect cleaner for leather, vinyl, plastic, rubber trim, bumpers, tires, canvas tops. Ph correct cleaning and light conditioning in one step. Use soft terry towel or soft brush to scrub grain. For maintenance, detailing, and after Rejuvenator Oil. This is a super stand alone cleaner/ protector for your everyday leather seat details. Works best when coupled with the oil and the use this product to clean. Prestine Clean is great! Will be my go-to cleaner from now on. Has no smells, leaves no residue, just a clean surface. I love it. Great product. In addition to upholstery, use it on rubber window, door, trunk, and hood seals.